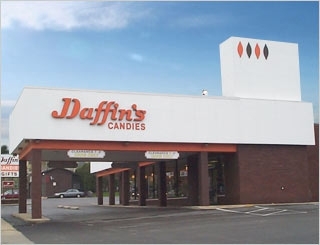 Daffin’s certainly didn’t have the appearance of the World’s Largest Candy Store. There was nary a sign of any sort of Kingdom, much less a chocolate one. But we dutifully parked and thought it might be different inside. With a 9-year-old racing to the front door, we gave it a pull and….my what a nice Hallmark store. Oh wait, there’s an ENTIRE wall of salt water taffy. And this was a pretty long wall. You have to understand, I LOVE salt water taffy, so this was good enough for me. We filled a couple of small paper bags full of taffy with our favorite flavors. The perfect snack for a long car ride home. It was now time to step foot in Daffin’s Chocolate Kingdom! Oh boy! It’s in the back, I’ll bet it’s going to be huge… We open the door and let’s just say the kingdom wasn’t mighty. The kingdom included a 400-pound chocolate turtle and smaller (but impressively-sized) creatures including an elephant, a frog, and a reindeer. And two nice ladies gave us free sample of Daffin’s chocolate. Which were awesome. So good. They would need a higher fence to keep me from all that chocolate! But the kingdom was 5 minutes of “wow, look at that. Here, take a picture” and good-bye. Ah, so more accurately, it might be the store with the largest footprint that offers a good amount of candy (and chocolate animals). She did give me some Daffin’s trivia. Such as the turtle was made over 40 years ago, and each year gets a new layer of chocolate painted on it, to preserve its appearance. And obviously they have a good set of generators in case of sweltering summer setbacks. We would not recommend a trip to Daffin’s if you want to check off “World’s Largest Candy Store” because it’s kind of a false claim. (I can suggest an outrageously good candy store in Cape Cod though, if you are interested). We give Daffin’s a 2 out of 10. Editor’s Note: Daffin’s is 20,000 square feet. Candylicious, a 10,000 square-foot store which opened in Dubai in 2009, also claims to be the world’s largest candy store. There's drool on my keyboard. I can not believe they would mess with chocoholics minds like that! I applaud Tom on his restraint, I probably would have gone straight to the governors home. Thanks for your comment, Becky! Yes, there’s a lot to be said for family-operated businesses which focus on quality! Wow, harsh. I didn’t care for the chocolate kingdom, but the selection of candy and the prices were great. They sell both their chocolate treats made by them and all sorts of other candies. My guess is that the lack of flash (looking like a card shop) is what helps them keep the prices more like a grocery store and less like Dylan’s Candy Bar (where stuff costs 4x as much).The factory tour is also notable (in nearby Farrell), but probably not flashy enough for this crowd. Oh, but we LOVE chocolate, especially in large, inexpensive quantities! And to be fair, Tom visited in the middle of a long, exhausting road trip…following a snow storm! What you’re saying makes sense as a qualifier, but doesn’t match the 2 out of 10 rating and “What to Avoid” title. But I guess the reason that your team visited wouldn’t be for the same reason I would go … candy. Yes, avoid the kitchy and dubious chocolate kingdom in the back … but if you’re planning a wedding and need Jordan Almonds for 100 guests and only have $25 or you have a kid’s birthday party to get favors for you’re gonna want to make this your first stop and bring the kids. As a parent (well, I’m not, but as an aunt) this is a great opportunity to browse the aisle with a child and talk about what kind of candy they like and why and what kind you ate at their age (chances are they have it there). Though I agree with Tom’s overall view on this stop there are a few things he forgot to take into consideration. The 9 yr old, for the rest of her life, will be able to say that she’s been to the “world’s largest candy store.” Bragging rights in this house mean a lot and since her brother did not join us for this particular trip she’s got them! It was also a fun, unnecessary, make vacation last a little bit longer kind of stop. One of those things that as a kid make your vacations even more memorable. So maybe it was silly. Maybe it didn’t live up to it’s name. Maybe we bought ‘gifts” and candy we didn’t need. It also created for us a great memory, a “remember when we” moment that we will have for the rest of our lives. Thanks for making that point, Rachel! Often it doesn’t matter where we go…as long as the kids enjoy it and create memories from it, then that’s more than enough! What’s our next assignment Traci? I bet that Candylicious is pretty darn awesome and totally full of candy. We’ve got a Canylicious here in Houston. It’s small, but it’s wall to wall candy. I’d like to know the good candy store in Cape Cod, though Daffin’s sounds like a pretty good candy store even though it’s a ‘big’ disappointment. we travlel from the mid west to the east coast a few times a year and have wanted to stop at daffins but cant seem to find them. the last trip a big sign on I-80- said Daffins this exit at the exit we drove for several miles to the end of the road actually into downtown Sharron, with no luck. main reason is I can envision me and the kids just gorging ourselves with the free samples they boast to pass out. However that salt water taffy wall sounds very promising. our next trip east is comming up and a stop is (has) going to happen. Maybe I need to pick up a GPS system . We also purchase Daffins Chocolates occasionally…this Xmas, maybe?!? Thanks for writing, Jerenne! I’m always glad to hear what people have to say about a place we’ve posted about. Especially when I’ve not been there myself. This was a guest review, and this person obviously did not try the Meltaways! 🙂 Merry Christmas!